He's faced off against demons in Hell. He's battled the dead in the future. He's even combated the armies of darkness in space. 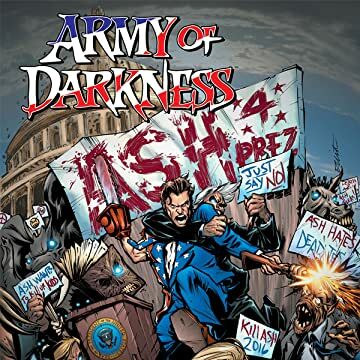 But Ash Williams has never gone up against evil in an arena like this: the political arena! 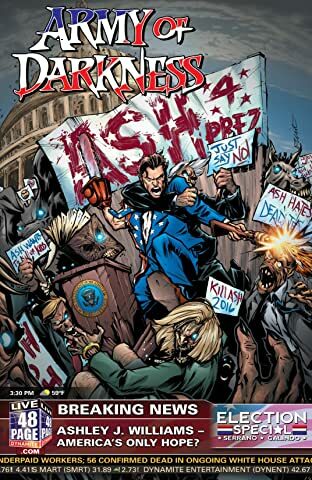 From the writer who brought you "Hail to the Queen, Baby" and "Ash Saves Obama" comes the off-beat adventure that answers the question: "What if Ash Williams ran for President of the United States?" When the Necronomicon Ex Mortis gives him a cryptic message, Ash Williams enlists the help of a beautiful psychic to help him track down the agent of the "Great Darkness", an evil so great that it threatens both humankind and the demon realm. But what happens when the search for truth takes Ash on a trail that he never expected... the campaign trail?